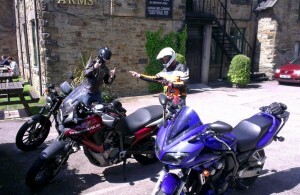 During my recent visit to Shrewsbury I had chance to catch up with two of my sister’s buddies who are also avid bikers. We had a nice leisurely Saturday afternoon ride out, with excellent sunny weather, quiet ish roads (compared to London anyway!) and a decent pub at our destination. I was joined by Blake, riding a heavily customised Harley 883 Sportster that sat barely a hairs breath off the road and Pete on a Honda Transalp adventure style bike. With me on the sports-tourer Fazer, we couldn’t have as far apart from one another in our styles of bike and riding posture. The route began in Shrewsbury centre and then took us out on the A53 through Shawbury, around Market Drayton, over the A51, before hanging a left in Whitmore down the a quiet rural road to Keele village for a slap up pub lunch. All in all, just over 30 miles and an hour each way. Most of the A53 is a fast, but winding A-road, interspersed with the odd village to switch the pace. The road from Whitmore is a much smaller, unclassified affair, deftly named Three Mile Lane, that snakes through quiet countryside and woodland before suddenly taking a bridge over the busy M6 (no interchange). 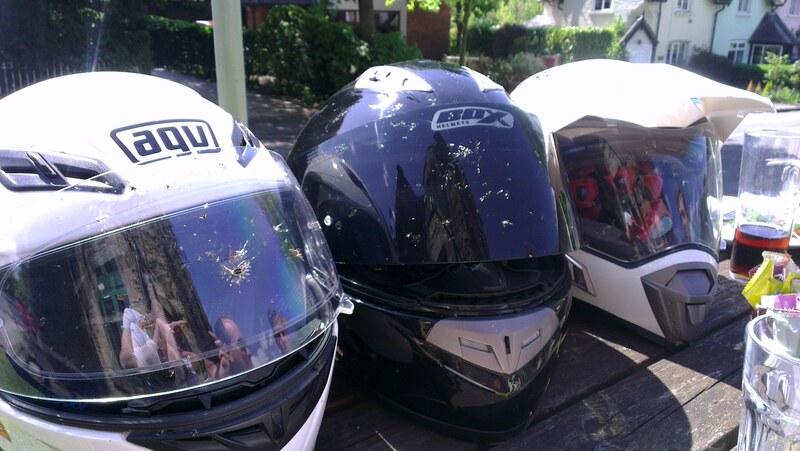 Keele is a small village on the outskirts of Newcastle-under-Lyme, that is probably best known for Keele University, famous for having the highest suicide rate in the country… Fear not, the only suicide today was the insect carnage on our helmets. The village itself is very picturesque, home to the Sneyd Arms Pub that serves top notch grub with plenty of seating outside, to sit in the sun and watch the village life sleepily pass by. The route was Blake’s choice, riding, who as a keen vblogger, has been sussing out many great roads around Shropshire and posting up videos of his exploits on YouTube. I highly recommend you head over and check them out, all quality video work and some great rides, including this very ride (shown below).